A few weeks ago a coworker asked me to make an eggplant parmesan for a post. I had no problem with this as eggplant is one my favorite vegetables and the traditional cheesy and tomatoey dish is one of my favorite ways to eat it. I was at the store buying the ingredients and I had an idea to do something a bit different with eggplant parm: Put it in an empanada. I had never really made empanadas before, but they were not that hard. The dough was pretty easy to make and work with. The cool thing about empanadas is that you can fill them with practically anything so I wasn’t too worried about this filling working out. 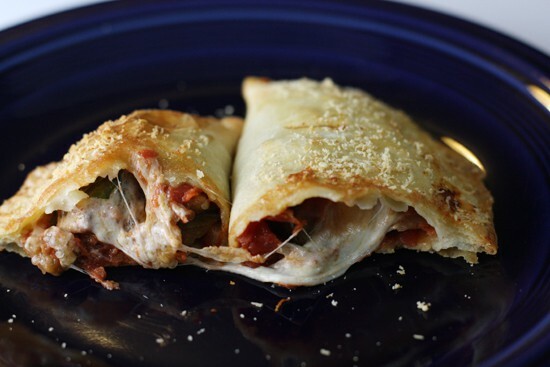 The classic Italian eggplant Parmesan dish smashed together in empanada form. 1) For the dough, mix together flour and salt. Then mash in the butter until it’s in coarse pieces. I just use my hands for this. 2) Add in the egg and water and stir until the dough forms a ball. You don’t want too much water, but use enough so that the dough comes together. Cover and let the dough rest for 30 minutes. Then roll out and use the dough for the empanadas. 1) Cube eggplant into 1/4-1/2 inch pieces. Toss with some olive oil in a large baking dish or baking sheet and season with salt. 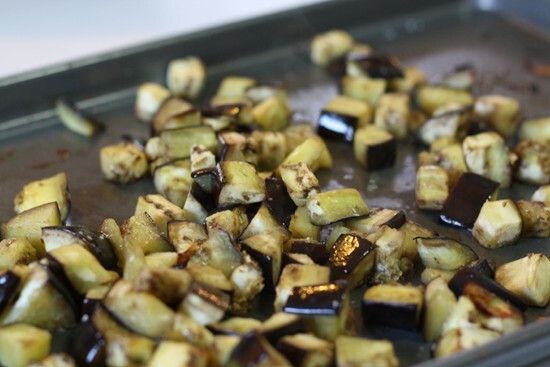 Roast the eggplant cubes at 350 degrees Fahrenheit for 20 minutes, stirring once or twice to ensure even cooking. 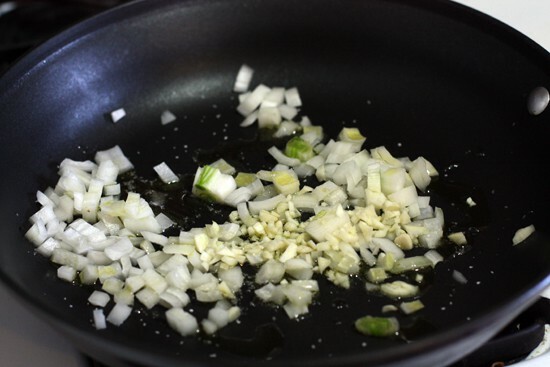 2) For the marinara, saute onion and garlic in olive oil over medium heat for a few minutes until veggies are soft, but not quite browned. Season with salt and pepper and a pinch of red pepper flakes. Then add the crushed tomatoes and cook the sauce down for 15-20 minutes, stirring regularly. 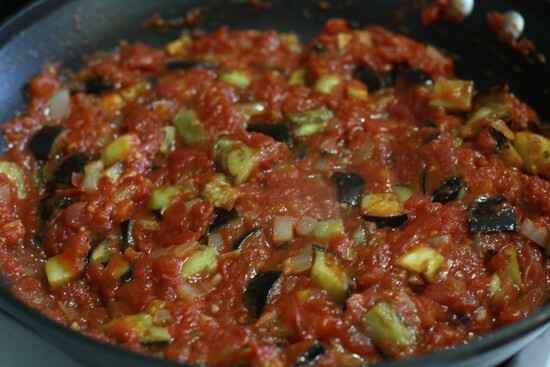 3) Stir the eggplant into the marinara sauce when both are done. 4) Roll your empanada dough out into a thin piece. You’ll need to flour both the surface and your rolling pin to prevent sticking. 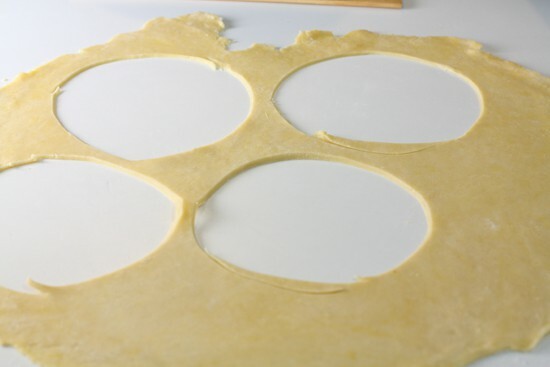 Use a small plate as a guide to cut 6-7 inch circles out of the dough for large empanadas. You will need to ball up the dough and re-roll it a few times to get all your circles cut. 5) Working with one circle of dough at a time, roll it a bit thinner. Add some filling to the center of the empanada. Be sure to leave about an inch around the outside for sealing. Try not to over-fill the empanadas. 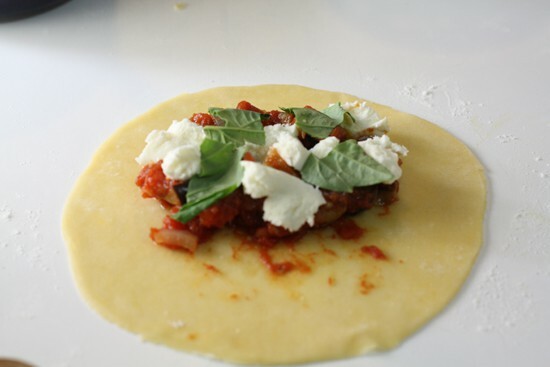 Top the filling with cheese and fresh basil leaves. 6) Brush the empanadas with egg wash (1 egg scrambled with 1 tablespoon water) around the rim of the dough. Fold the empanada over and seal it around the edges. I used a fork to get a good seal. 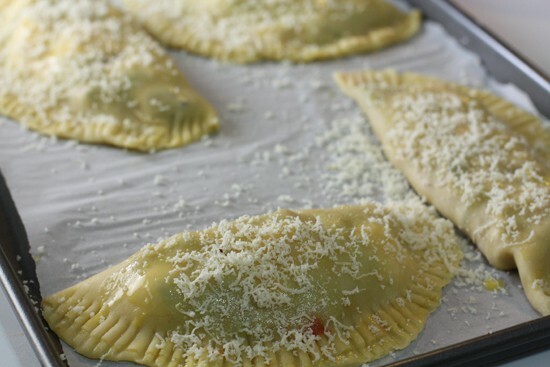 7) When all the empanadas are formed, brush them with extra egg wash and sprinkle with Parmesan cheese. 8) Bake the empanadas at 350 degrees F. for 20-25 minutes until they are nicely browned. Serve immediately! If you’ve ever made a pie dough before, this will be very familiar to you. It is basically a pie dough recipe with an egg in it, which makes it easier to work with and a bit more substantial. You start the dough the same way you do a pie dough. 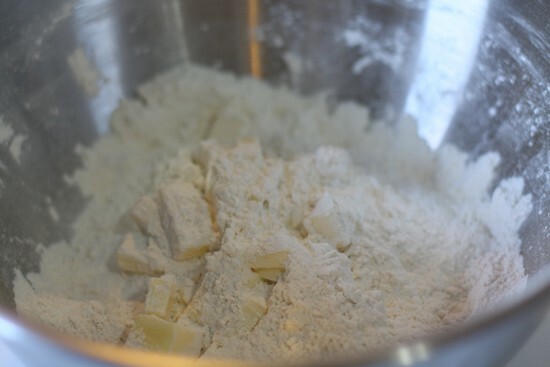 Mix together your flour and salt, then put in your butter and mush it into the flour. If you have a food processor, you could process the dough in that for a few pulses to get the butter distributed. I like to mush the flour and butter together using a fork and my fingers. This is basically a pie crust. Then add the egg and the water until the dough forms a ball. You may need to add a bit more water, but add it slowly. You don’t want too much water. Then cover your dough ball and let it rest for 30 minutes. That happens to be about how much time you’ll need to make the filling. First, you’ll want one of these guys. One of my favorite vegetables. 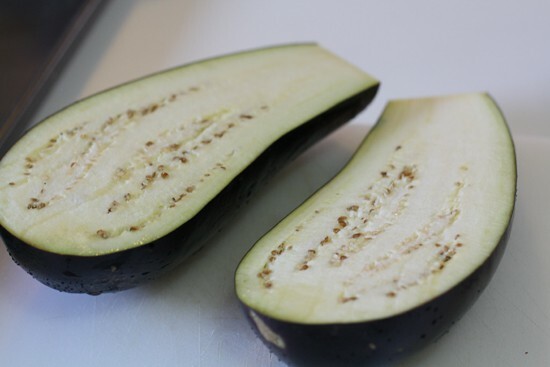 Some people are intimidated by eggplant, but this is about the easiest way to prepare it that I know of. Wash it, chop off the ends, and cut it into cubes about 1/4 – 1/2 inch big. Put the cubes in a baking dish, coat them with about 3 or 4 Tablespoons of olive oil and a good sprinkle of salt. Roast the eggplant in the oven at 350 for about 20 minutes, turning the little cubes halfway through. Twenty minutes also happens to be about how long it will take to make the simple marinara sauce for the filling. The times all really work out grand in this recipe. Saute all your ingredients for a few minutes in the olive oil and then add the tomatoes. Let that all simmer down on medium-low for 15 or 20 minutes stirring occasionally. That will be about when your eggplant is done! My favorite way to eat eggplant. I think it is important to have some pretty good sized cubes of eggplant in these empanadas for texture. After the eggplant is roasted and delicious, throw it all together with your marinara. Easy breezy. Now back to that dough. Like I said, I found this dough to be pretty easy to work with. Roll it out into a thin layer. You’ll need a bit of flour to keep the dough from sticking, or you could roll the dough between some wax paper. I used a plate as a guide to cut out circles that were about 7 inches in diameter. Obviously, you will need to ball the dough up and re-roll it once or twice to get all your circles. Those are about 6-7 inches in diameter. Once you get your circles done, take one, and roll it out a bit more. Try to get the edges a bit narrower than the center because when you fold it over the edges will be stuck together. If the outsides aren’t more narrow to start, then you will have a really thick edge on your empanadas. Don’t freak out about getting it perfect though. Depending on the size of empanadas you’re trying, you will need a different amount of filling obviously. But this is how mine looked. I layered some eggplant filling, followed by some mozzarella cheese and finally a few basil leaves. Rub some egg wash (1 egg 1 Tablespoon water) around the rim of the circle and fold it over. Try to get out some of the air if there is any trapped in the middle. Then seal it up around the edges. I used a fork to get a good seal on these guys. I brushed some more egg wash on top, cut a few slits on top to allow steam to escape, and then sprinkled them with some Parmesan cheese. These are eggplant Parm inspired after all. Traditionally, empanadas are fried and you could definitely fry these if you wanted. If you do then don’t brush with egg wash and maybe add the Parm to the filling. I decided to bake mine at 350 for about 20-25 minutes. Trust me. You want this. The dough was really light and flaky (like pie crust) and the filling had a serious eggplant parm flavor although I would say it is a bit healthier since the traditional dish has fried eggplant in it. I’m totally in love with these little guys and I think you will be too. Anyone else make empanadas? Got any other inventive fillings? I am from Argentina and empanada is such a common meal there. Our typical filling is made with meat, olives, eggs, peppers and onions…. it's the best! 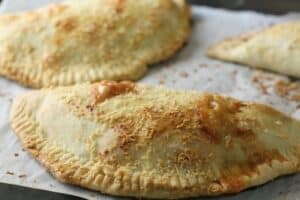 I love the idea of eggpant and cheese in a filling for empanadas! Delicious! These look awesome. Being the coworker referenced in your piece, I am going to have to demand a taste test. Mmmm, I love this idea too. I am so ready for one! What a great idea and a simple recipe. I may have to get my eggplant on soon! We might be getting some local ones here in the next month actually. Mmmmm, fresh local eggplant, fresh local basil…now if there was only a true cheese maker here! They look great. Though I am not much of an eggplant eater. I think these would be good with some sort of super sweet caramelized onion filling, maybe some brie. Okay, I really might try that. My daughter has an A-Z party coming up and she pulled the letter "E". I was worried I would not be able to find anything unique, but this will be perfect. Can't wait to try them out. Great great great idea!!!!!!! You are so creative. I’m from Argentina and I’m so familiar with empanadas. I love them! I am vegetarian so I definetely will try this. I had one recipe here http://unacenadiferente.blogspot.com/2011/08/empanadas.html they are made with texturized soy protein. I hope you like them. I just made these exquisite empanadas. Im from CHile and empanadas are one of out main dishes so I was exited to see this recipe. I added mini portobello mushrooms to the recipe.. I roasted them along with the eggplants and I gave it a 3 min broil at the end. My empanadas ended up a little dry but I think its because I thought it was going to be too moot, but now I know that could have added an extra tomato. Anyways… love the blog… love the recipe! Go at it Nick! THanks for trying the recipe Samy! Glad you liked it. Sorry they came out a bit on the dry side, but hopefully still flavorful for ya. I’ve been on an empanada bender for a few weeks now. It’s so nice to make a few dozen with whatever random ingredients are on hand, even leftovers, and have quick meals in the fridge for days to come. The pastry takes too long, though, so I go to the Latin market and buy the pastry dough and keep a few dozen packs in the freezer at all times. I’m sure that dough is not as good as this one, but it sure saves time. I made up this recipe and added feta cheese and kalamata olives, and they came out tasting like scrumptious “Greek” empanadas. Great recipe!